A favourite Viva! breakfast... We tend to have this on toast but it could also be served as part of a cooked Full Vegan. Or to make it into the Garlic Mushroom & Marinated Tofu Wrap, see below! 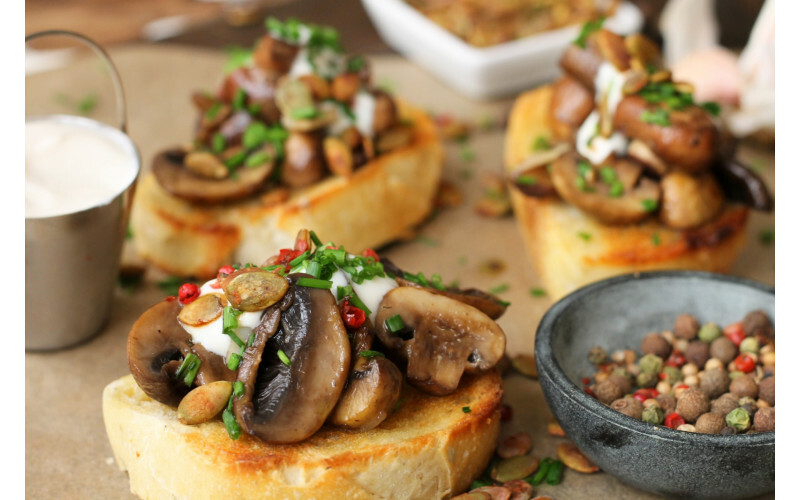 Using white value mushrooms makes this more economical but if you can find bargain portobellos (the big mushrooms) or chestnut mushroomss, go for it! To convert this into the Garlic Mushroom & Marinated Tofu Wrap option, just add some Cauldron marinated pieces or chopped Taifun smoked tofu to the mushroom mixture at the end of cooking and warm through. Oven-warm or microwave some wraps and place a dollop of mixture into each wrap that you're serving. 1. If using small mushrooms, wipe clean quickly or just quickly rinse under the tap to dislodge the bits of earth. Then break up with your fingers - yes, you can slice them but it's time-consuming. 2. If using bigger mushrooms, slice into big chunks with the knife. 3. Heat the oil or oil/margarine mixture in the pan. Add the mushrooms and let them cook until golden, stirring occasionally. Put the toast on now if using. 5. Add the chopped or crushed garlic - or purée if using - and cook in, stirring for a minute or two so it doesn't catch and burn. Add any of the options from the list you fancy. Drizzle in the soya sauce and mix in well. 5. Serve hot on toast if that's what you're having. If you're using the wrap version, heat the wraps up, heat through the tofu with the mushroom mixture and serve.